I returned to my apartment in Grafton alone to splash in the hurricane which had just struck the Hampton Roads area. I was in charge of feeding ducks in my complex for a week while the elderly lady who usually did it evacuated. We agreed I would feed the little bastards. I tried and tried to coax them into my apartment to become their best friend but it didn't work. They're smart...those bastards. On September 28, after chatting with Ha for ten minutes under an anonymous name, seeing that I was hopelessly lost, I took up an offer by a local introductions service. I wanted to move on with my life but I was so lonely I couldn't conjure up enough energy to do much with it. So I turned it over to professionals. They'd search out someone for me and I could concentrate on living my life instead of finding someone to live it with, which I was sorely unqualified for. And then on October 1, the big day. I became Technical Sergeant Paul. 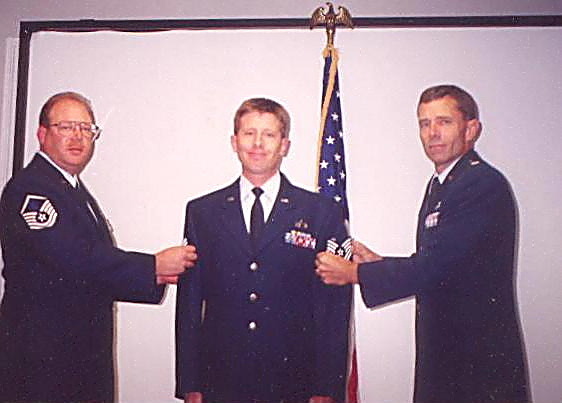 I had worked a 13-hour night shift so I had to bring three uniforms--a battle dress uniform for my shift with my Staff Sergeant stripes, then another battle dress uniform for after midnight with different stripes when my Technical Sergeant rank became effective, and then this goofy blue dress uniform for the promotion ceremony with my boss Michael K. and my commander, Lt. Colonel Gott. I liked Colonel Gott--he was an avid cyclist and I used to go by his office and talk about bicycles. He owned a bicycle way more expensive than mine. When I'd have to brief him, if he arrived early, I'd chat bicycles before the crowd arrived to ease the tension. Cool guy--and funny, in a weird way. I was so sleepy now having been at work for 15 hours everyone looked cool. 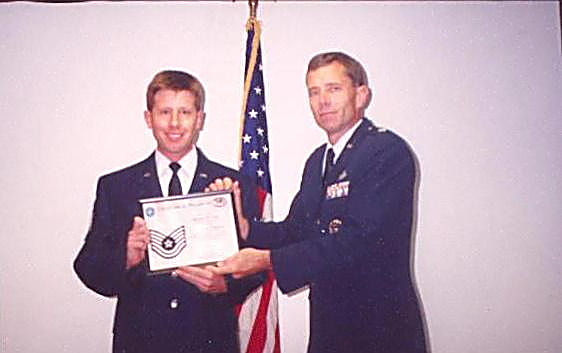 I had struggled for three years to get this rank, coming very close two years prior and then losing my mind the next year, and after being married for eight years as a Staff Sergeant, knowing so many other wonderful people, I looked out over the audience on this which was supposed to be my proud day, and saw not one of them. It was a bittersweet moment. Cathy and I had been talking for weeks. I wrote her a poem for her 24th birthday, and we talked about how she could improve her chances of meeting her mate. We connected this way because we'd both been badly hurt, and at this time had little self esteem and little hope of finding someone. I talked to her about clothing, makeup....little things like that. I kept saying,"It's all in the packaging...you are a wonderful person but you have to package yourself to attract someone". It seems funny now but I really enjoyed it. I thought I could make a difference. 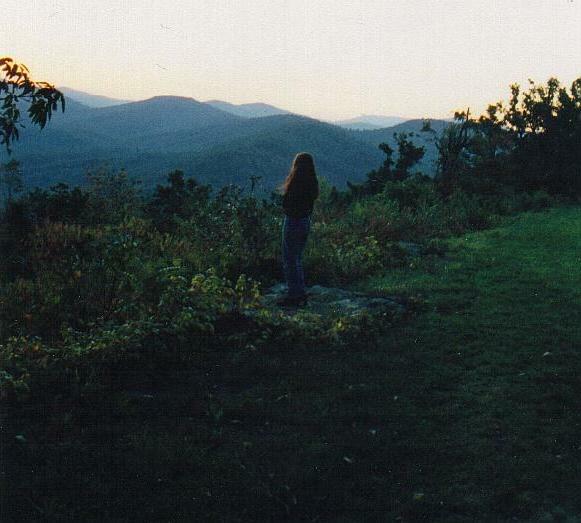 When I was promoted on the 1st I had a long weekend ahead of me and knowing I'd get very down being alone, I went against my better judgment and asked Cathy if she wanted to drive up in the mountains and stay at the Afton Inn on the Blue Ridge Parkway. I'd always wanted to stay there--it's on the ridge and there's a beautiful overlook. We were friends so we'd just sit up and talk, relax, and get away from the world. We both thought it would be fun and after talking so much we trusted each other. Besides, the drive to her house was too long to just turn around and come back. With her family living in the trailer with her, we couldn't have any privacy. After the promotion, I got a little sleep, and then, weary-eyed, drove 2 1/2 hours to Scottsville. I didn't think I should lead her on but then, I just knew I didn't want to be alone. I drove up to her trailer again like I'd done three weeks earlier and she stepped out. I could not believe the transformation--she looked...uhhh...beautiful. It was like Cinderella before my eyes. I was shocked. My advice worked too well. We drove away and I could not believe it but I was feeling very attracted to her. We ate at the restaurant on the top of the mountain, went back to the room and talked and watched television. Then she tried on some dresses to show me, and while she told me she didn't think any of them looked very good I kept telling her otherwise. She wouldn't listen, so I kissed her. She kissed me back, I kissed her back, and the two years of feeling helpless, hopeless, and unattractive ended. It was nice. 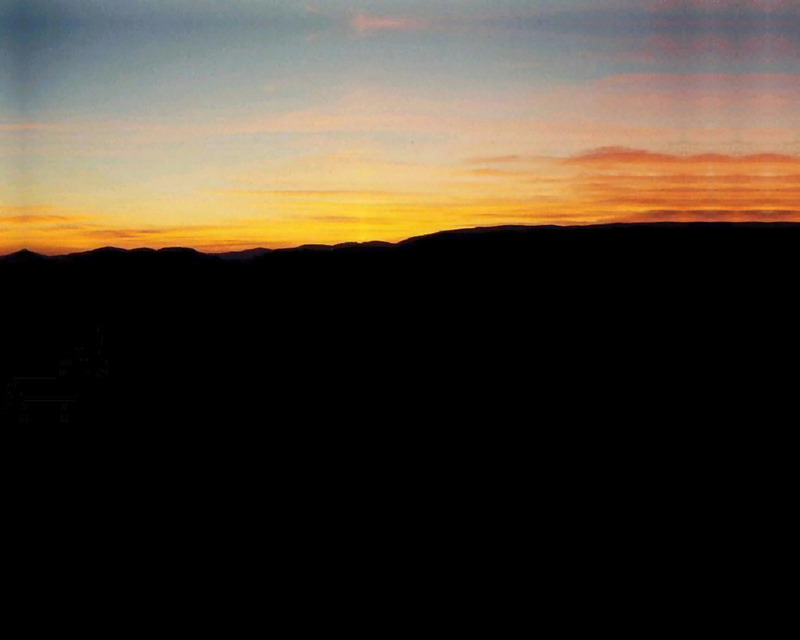 The next day we went to Lake Sherando, drove the Blue Ridge Parkway, watched this sunset and, looked at each other strangely, questioning, trying to figure out what we'd just experienced together. It was completely unexpected but welcomed.